Called the “plant of immortality" by ancient Egyptians, aloe vera has been used for many medicinal and skincare purposes for many years. Aloe vera is known as a proven skin soother and moisturizer and for that reason, it's a popular skincare ingredient. Also an effective acne fighter, aloe vera contains salicylic acid, saponin and barbaloin which kill acne bacteria as well as auxin and gibberellins, two hormones with wound healing and anti-inflammatory properties that reduce skin inflammation and promote the growth of new cells. I was recently sent some products from Lexli which feature a base of organic, pharmaceutical-grade aloe vera instead of water. 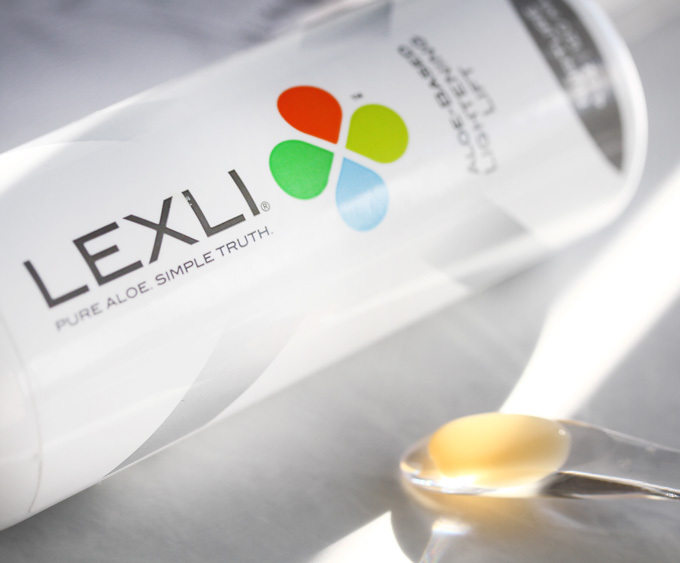 The story of Lexli begins with Dr. Ahmed Abdullah, a board-certified plastic surgeon who was motivated to develop his own products after an unsuccessful quest to find products with base of pharmaceutical-grade aloe vera after clinical study results showed impressive results on surgical skin flaps to calm inflammation and encourage healing. 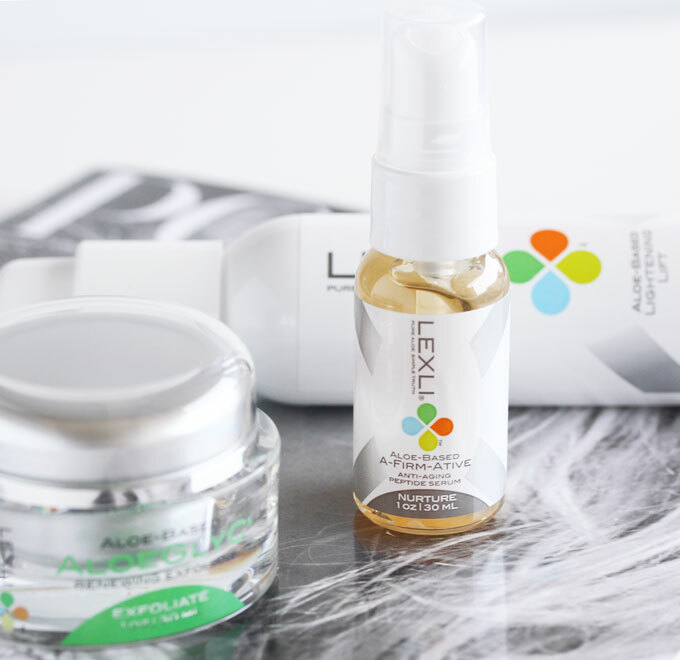 Following two years of development, Dr. Abdullah formulated a facial exfoliator featuring a glycolic acid with a low pH along with a high concentration of pharmaceutical-grade aloe vera. The then unnamed product went on to become the breakthrough AloeGlyC® and the rest of the range grew from there. 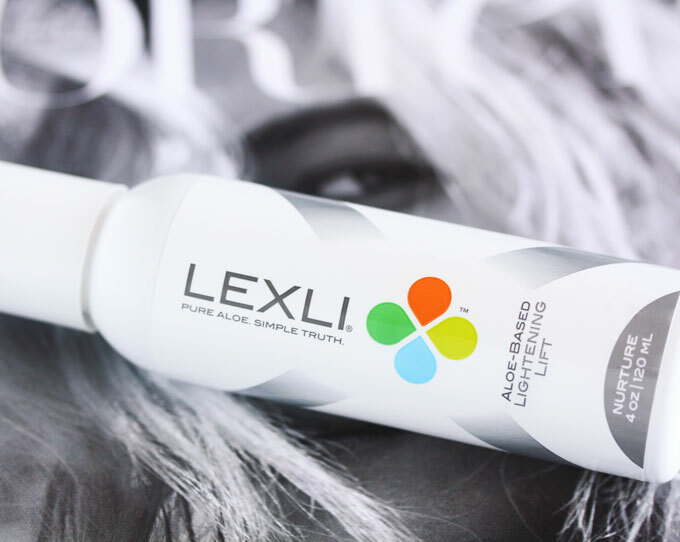 While there are many skincare products out there that contain aloe, Lexli uses organic, high grade, aloe that is free of impurities as a base. Aloe is listed the first ingredient in their products and this is important because higher concentrations translate to more effective benefits. The aloe in Lexli products is certified by the International Aloe Science Council (IASC) which means that the aloe has been properly harvested and processed to ensure the highest quality. This is notable since the active components in aloe tend to degrade and lose their effectiveness soon after harvesting if not handled properly. 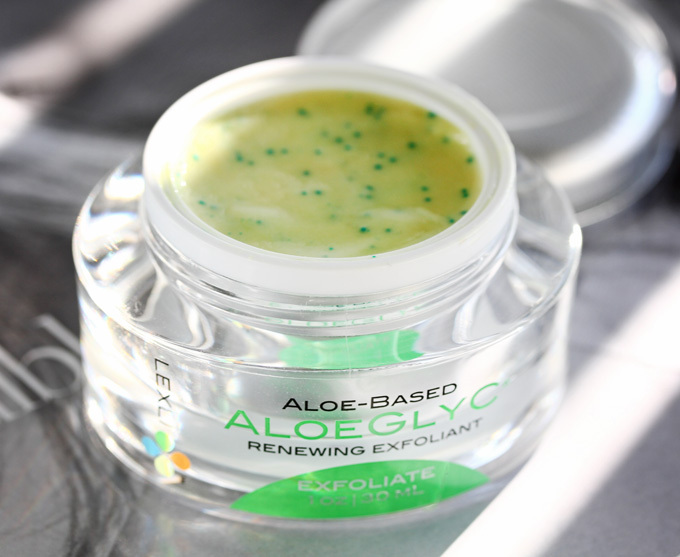 The first product ever developed by the brand, AloeGlyC is a unique facial exfoliator that works to stimulate the skin's natural rejuvenation response to promote healthier and younger looking skin. 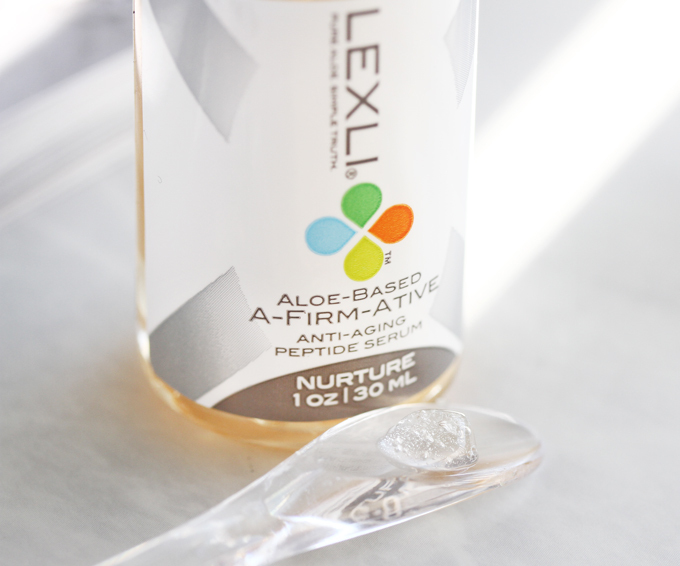 formulated with a base of organic, pharmaceutical-grade aloe vera and glycolic acid, an alpha-hydroxy acid. It is rich in antioxidants, including Vitamin C beads, as well as Vitamins A, D and E and Green Tea, that work to neutralize free radical damage. This patented exfoliator has a pH similar to that of a professional chemical peel and works similarly but without the risk of burn or redness. Skin will be noticeably brighter and softer with just one use and with consistent daily use, AloeGlyC can improve the appearance of sun-damaged and aging skin by smoothing skin texture, reducing hyperpigmentation, and diminishing the appearance of fine lines and wrinkles. 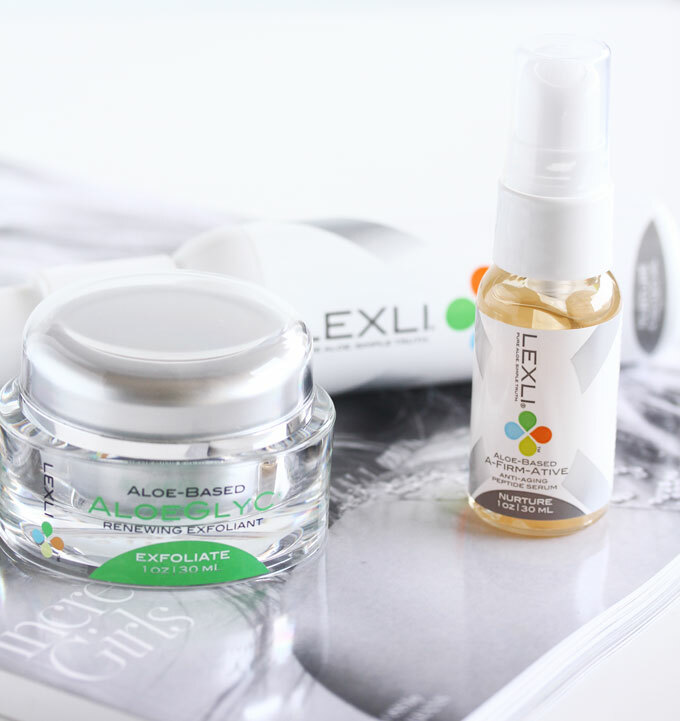 Acne prone skin will also benefit from AloeGlyC's ability to unclog pores and minimize their appearance while reducing post-acne pigmentation. 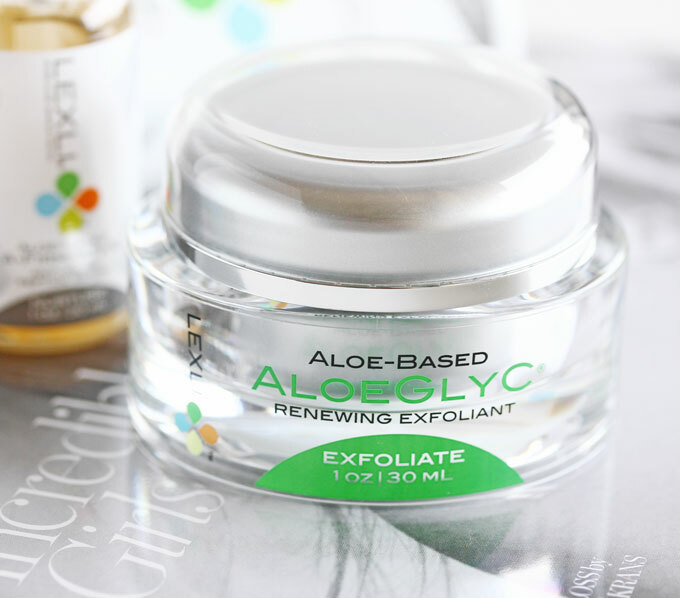 AloeGlyC facial exfoliator is appropriate for use on all skin types, including normal, dry, combination, sensitive, oily and acne-prone. AloeGlyC is packaged in a substantial clear plastic jar with a screw off top. Recommended application is to place a small amount of product in the palm of your hand, smoothing onto face and neck using gentle upward and outward strokes, Allow the exfoliator to sit on skin for 10 to 15 minutes before applying the moisturizer. It does not get rinsed off. The product has a cool, gel like texture and a slightly odd herbal scent which isn't pleasant but bearable. The Vitamin C beads dissolve readily as the exfoliator is worked into the skin and as the time elapses the product absorbs in without any stickiness. I was initially a little concerned that it doesn't get washed off but I didn't feel any irritation or dryness as it was doing it's thing and it does do it's thing. My skin was noticeably brighter and smoother when I woke up the next morning after the first time I used it. Over exfoliation is something I actively try to avoid so I only use this at night and space it out even though the week but I do see benefits when I do. I do have to use a heavier moisturizer with this which isn't a big deal. I also had my husband try this. He can use it more frequently and it's done wonders for his pores and his acne scars. Lightening Lift is an aloe vera powered facial mask that works to transform your skin. Formulated with a potent blend of botanicals, including Green Tea, Acacia, Ginseng, Indian Gooseberry, Sage, Grape Seed and Kojic Acid, this multi benefit product brightens uneven skin tone, improves overall texture through light exfoliation and calms inflammation while providing antioxidant protection from the environmental aggressors that cause premature aging. This can be an ideal treatment before an important event because a single use can promote the look of firm and smooth skin while supplying significant hydration. It can be used as needed. Those looking for anti-acne or anti-aging benefits may use it daily. Lightening Lift is appropriate for all skin types, including normal, dry, combination, oily, acne-prone, sensitive and aging skin. Lightening Lift is packaged in a heavyweight plastic bottle with a lockable pump dispenser that can be opened up. Recommended application is to apply onto damp skin following cleansing, using gentle upward and outward strokes. After allowing the mask to dry for 10 to 15 minutes, it will become firm and tight. When it begins to crack, it is fully dry and then it can be removed with a clean cloth dampened with lukewarm water. The texture and consistency of this mask is thick and slightly sticky like honey with a strong aloe vera scent. It's a little unwieldy to apply but I find it works best if I work quickly. It feels a little cool going and as it dries it does start to tighten and pull. The first time I used it, my husband thought I was using the Hanacure Mask. The pulling isn't as dramatic but this mask does deliver instant visible results leaving my face feeling refreshed and looking taut and brightened. The firming effect is temporary but this mask does do a nice job with brightening. It is a good one to use before events. While the Hanacure Mask yields more powerful results, I think the Lexli Lightning Lift is comparable and more affordable alternative. A-Firm-Ative is a serum that works to hydrate and transform the skin. It is formulated with Lexli’s signature base of organic, pharmaceutical-grade aloe vera and an advanced peptide that has been clinically proven to improve the appearance of fine lines and wrinkles, especially on crow’s feet and the forehead area. Twice-daily application of A-Firm-Ative Peptide Serum can promote brighter, plumper, more even toned and smoother skin within the first few weeks of use. Consistent use can lead to an overall improvement in firmness and texture. A-Firm-Ative is appropriate for all skin types, including normal, dry, combination, oily, acne-prone, sensitive and aging skin. A-Firm-Ative is packaged in a lightweight, clear plastic bottle with a covered pump dispenser that can be opened up. Recommended application is to smooth onto skin following cleansing, using gentle upward and outward strokes, followed by moisturizer. Despite a golden appearance in the bottle, this serum when dispensed is clear in color with lightweight gel-like texture. Despite not having any added fragrance, it has a strong perfume like scent which I really do not enjoy. The product is hydrating and wears well under moisturizer. While it is pleasant enough, I don't know if I can say it's considerably improved my skin and I just can't really get over the smell. 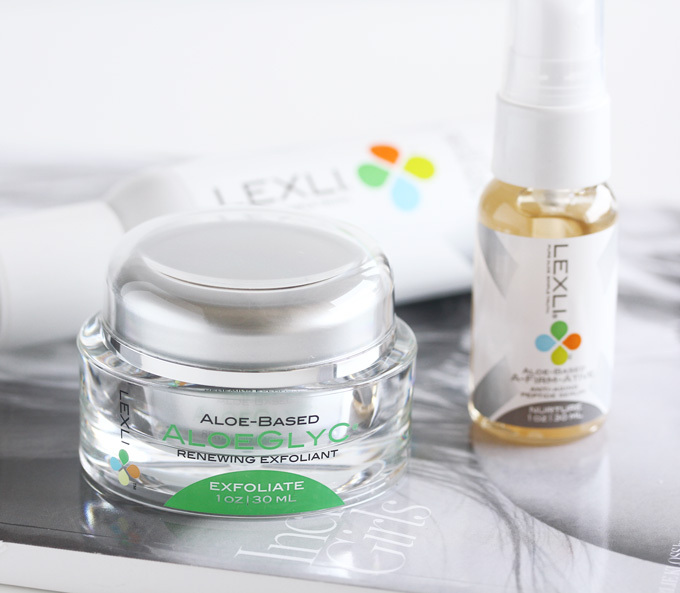 I didn't really use many products with aloe before trying these Lexli products and I have to say I'm really impressed and sold on the power of aloe vera. The entire range is Leaping Bunny certified, cruelty free and paraben free, and many of the products are vegan. The Lightening Lift is a new favorite which I would probably repurchase and I also really like the AloeGlyC. The only product that didn't impress me was the A-Firm-Ative. 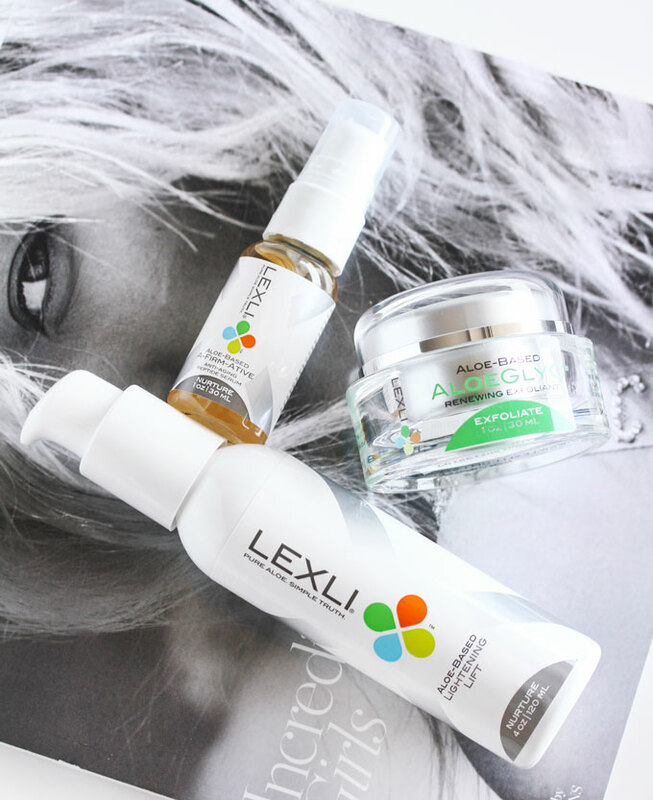 These Lexli Aloe Based skincare products can be purchased through the brand's website. A selection of products are offered on their Amazon store front. Their full product range includes comprehensive facial care and acne care solutions as well as body care. They do offer a 90 day money back guarantee and international shipping to select countries. What do you think of this brand? Do you use aloe vera in your skincare routine? Ooooo... I love the sound of that Lightening Lift. The aloe vera combined with the green tea and the ginseng...sign me up:) Thanks for the heads up as always, chingu. This sounds like a pretty cool range. I'm totally interested in the original exfoliator - how interesting that you leave it on! The anti-aging serum sounds good as well. It certainly makes me reevaluate and consider using more medical grade aloe now. Thanks for sahring these interesting products! This range is looking good, I love the packaging too.That serum looks so interesting and I need such serum in my life. The Aloe Vera and green tea combination is perfect. Great post dear. Yes, aloe vera definitely has many benefits. This skin brand sounds amazing. I love organic and natural based cosmetics. Great to know that aloe in these products is number one ingredient and also certified and pure. These products sound amazing Rowena! I love using Aloe Vera it has so many wonderful benefits for the skin! They sound like some really great products.. I haven't heard of the brand before, but I like products that are based on something other than water. Caudalie do the same thing with a few of their bits, but of course use Grape water instead of Aloe. Aloe Vera is definitely an ingredient I overlook often in favor of other more "effective" ingredients, but now I know that the difference in efficacy is probably due to the difference in ingredient quality! This post definitely got me interested in aloe based products again, and I especially like the sound of the AloeGlycC! Thank you for introducing me to this brand! Aloe Vera is really a power plant. It has so many great effects on skin and body. 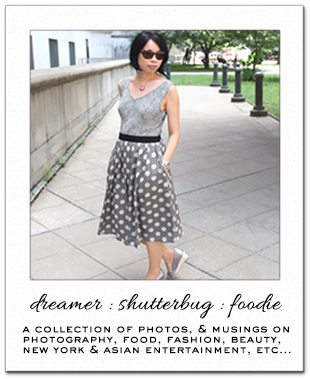 Loved to read about this brand, since it is totally new to me, too!